See also mapper by q375324. Font that can turn any text editor into a tile-based map editor for games. Useful for game developers. Made by request from a friend. Info: Created on 17th April 2014 . Last edited on 10th May 2014. Congratulations! FontStruct Staff have deemed your FontStruction worthy of special mention. 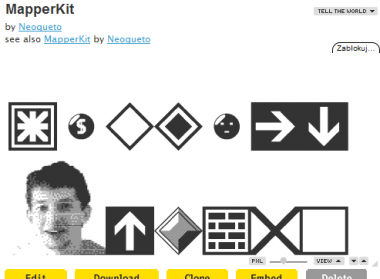 “MapperKit” is now a Top Pick. Never thought something like this would ever earn a TP. Thanks a lot, but honestly, I don't think it deserves that special mention. @p2pnut: sure he was, especially with the old version that contained a portrait of himself. Actually he was quite shocked and that became quite awkward, hahaha. Now I wanna make a game! Actually, dingbats, ANSI graphics and "tiles" serve a function that typography wasn't really prepared for and wound-up taking it in a whole new course. It is powerful and artistic, just as your font tiles or fontbats are, and hasn't really been tapped to near its full potential. There used to be a day when ANSI graphics ruled online bulletin boards and gaming. And your font shows off the power of the FontStructor, so I think it is a well deserved TP.